Think of the last time you did something wrong. Why did you do it? When we do something wrong it is easy to blame someone else. When Adam and Eve ate the forbidden fruit in the Garden of Eden, Adam blamed Eve for his sin. He was also blaming God because he blamed the woman God gave him. Eve blamed the serpent (Genesis 3). In 1 Samuel 15, King Saul blamed the people for his sin. However, when we do something wrong, we can only blame ourselves. Other people may urge you to do something wrong or tempt you to disobey your parents, if you are a young person, and God. But you—and only you—choose whether to obey or disobey. Someone might make it difficult to choose the right thing, or you may feel embarrassed to choose the right action, but you can make that tough choice. When you complain and blame you are saying that other people have control over your life. Irresponsible people make excuses for why they couldn’t complete a task, do their chores, or fulfill the responsibilities expected of them. They have lengthy stories and explanations of what went wrong and why they couldn’t keep their word and fulfill their obligation. They complain about lack of resources, time, ability, or the impact of others on their life. The sign was a reminder to the officials to do what was expected and keep their word because no one wants to hear their excuses, reasons for failure, or whining. That is why I posted it on my wall. Be strong and accept the embarrassment and penalty for your wrong. 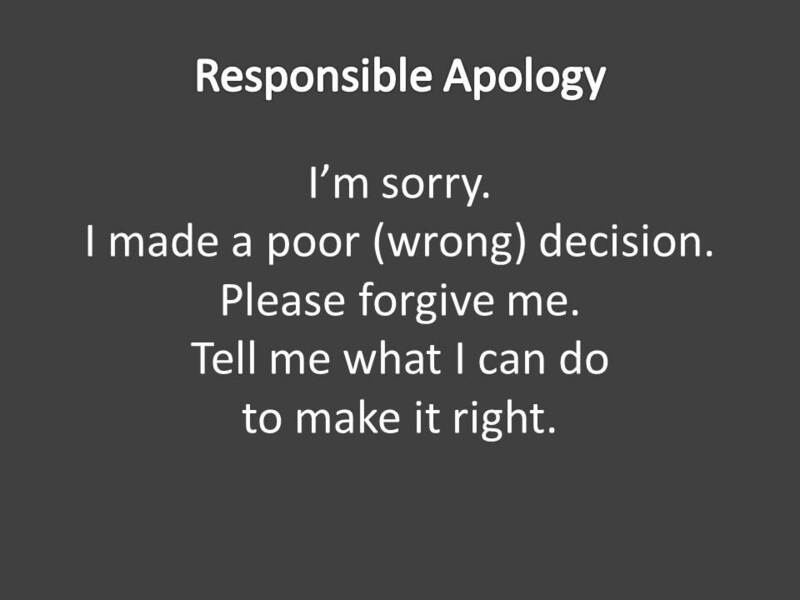 The non-apology: “If I did anything wrong…” Either you did or you didn’t. Avoiding your obligation to apologize, blaming everyone else and not accepting responsibility, or making excuses instead of owning your behavior. We must accept responsibility for our actions and our response. You acknowledge that your choice has hurt or caused difficulty for another and for that you are sincerely sorry. You take responsibility for your choice without offering excuses or explanations. You ask for their forgiveness because you need it. You ask what you can do to correct your poor choice. Maybe you can replace something, apologize to someone else, or maybe you can do nothing. But offer to do what you can to make it right and act quickly. You will be proud of yourself, you will bring honor to yourself, you will be responsible, and you will glorify God. *I’ve tried to verify it but have had little success confirming it. Any concrete attribution would be appreciated.